My mother-in-law and I are intending to send through Christmas (and other assorted) cards for the troops. I do have a question for you. Do you want each card, with its envelope, in a separate cellophane bag or are the cards and envelopes OK to be just put in a zip loc bag? Hello Michelle and also please send greetings to your Mother-In-Law for me. First, thank you both so very much for making Cards for the Troops! It is the generosity of people like yourselves who make this drive possible each year. To answer your question, no, it is not necessary to place each card in its own cellophane bag. As you can see from the photo, many of our past cards have arrived with their envelopes, all in a ziplock bag. Some people do place their cards in individual cellophane bags of course, and that is perfectly acceptable. The cards do receive more protection from oil from fingers that way and also their embellishments are protected better, but this is a personal choice, not a requirement. 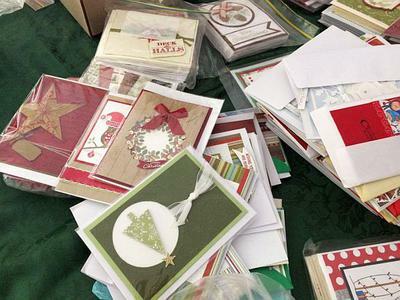 We just appreciate you wanting to craft for our deployed Troops and that you are willing to share your cards with them. There are lots of details about cards received in previous drives on this site, so you can see how they have been received and sent, if you would like to browse there. I see you are both in Perth. I was just there! I am still a traveling crafter at the moment. It would have been nice to try and meet for a coffee but we have gone west and south now, working towards the Nullarbor. I loved Perth and hope we get to come back there one day. Thank you again for sending us some cards for the Troops. My friend Shelia is collecting the cards for me in QLd while we travel and I will be able to see them before we send them off as I plan to return home to Qld in the next few months.